Young girls are disappearing around the country. Everyone assumes they are teenage runaways, headed for the big city and bright lights. They vanish without trace — society’s disposable children, There is nothing to connect them to each other, let alone the killer whose charming manner hides a warped and sick mind. Nobody moves around inside the messy heads of serial killers like Dr Tony Hill. Now heading up the recently founded National Profiling Task Force, he sets his team an exercise: they are given the details of thirty missing teenagers and asked to use their new techniques to discover whether there is a sinister link between any of the cases. Only one officer comes up with a concrete theory, but it is ridiculed by the rest of her group … until a killer murders and mutilates one of their number. Could the outrageous suspicion possibly be true? For Tony Hill, the murder of a member of his team becomes a matter for personal revenge. Aided by his previous colleague, Carol Jordan, he embarks upon a campaign of psychological terrorism – a game of cat and mouse where the roles of hunter and hunted are all too easily reversed. This is a shocking book, stunningly exciting, horrifyingly good. It is so convincing that one fears reality may be like this and these events the awful truth. 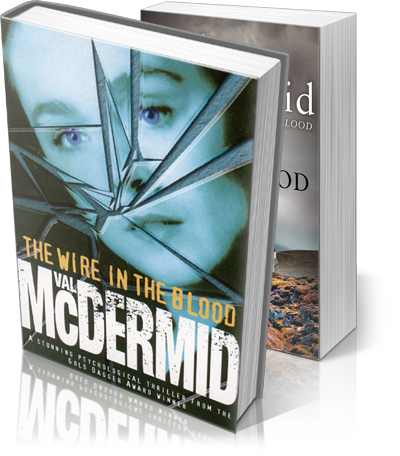 The Wire in the Blood is truly frightening, McDermid’s capacity to enter the warped mind of a deviant criminal is shiveringly convincing, and she is equally adept at portraying the interactions, allegiances and petty jealousies that exist among the investigators. Hill, driven and disturbed, is an appealing and original character. This is a writer who just gets better and better. The novel has the same compelling combination of sexual-political mischief and Jacobean psychological intensity that earned the author the crime novel of the year award for The Mermaids Singing. Tension-filled sequel to The Mermaids Singing The story, handled with verve, wit and style, never flags. Terrific chiller from Manchester’s answer to Thomas Harris. Val McDermid can do what the Americans do so effortlessly – get inside the mind of a serial killer. Thank God for Tony Hill and psychological profiling. The book [has] a sense of gravitas and intelligence utterly beyond lesser writers in the field This is a wholly satisfying read which cleverly subverts tradition and expectation. Having already awarded her previous Tony Hill novel a Gold Dagger, someone better be smelting the platinum. McDermid is no novice at tense thriller writing and it shows. Her handling is sly and sophisticated, weaving the mundane with the stomach-churningly depraved. 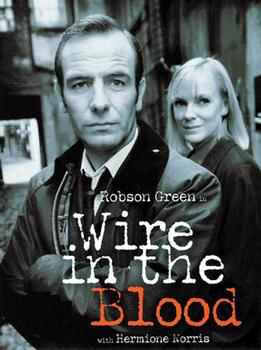 Intelligent, convincing and compelling, The Wire in the Blood takes risks with plot and character, undercutting all the normal devices of thriller structure in a highly readable and scary book. Val McDermid is an accomplished storyteller, and this scary, fast-moving tale is engrossing.